Description: A customizable, printable and sharable Chinese zodiac diagram is provided for free download. Vector animal clipart are applied to make the diagram vivid. Quickly get a head-start when learning Chinese zodiac. 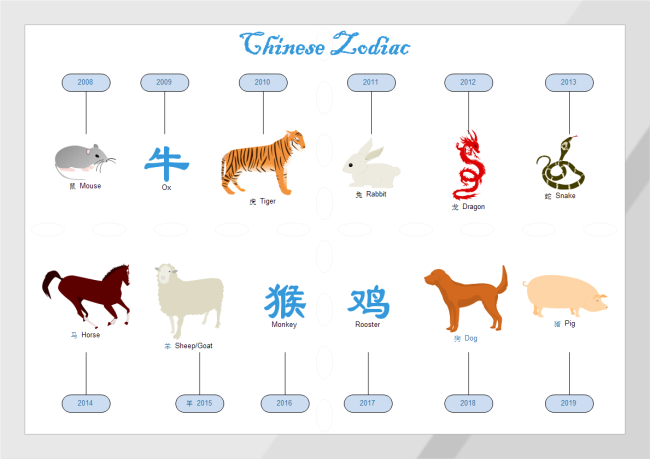 This simple Chinese zodiac diagram example is created by Edraw Max, which is available in different formats. Apply graphic organizers into any theme or topic to promote yousr students learning. Create your own effortlessly by starting with one of our professionally designed graphic organizer templates.